George C. Duncan, Ship's Secretary, trained at Pensacola and assigned to the Wee Vee. While flying off a cruiser, he once brought back some 200 bullet holes in an SOC airplane. His decorations include the Navy Cross, Silver Star Medal, Distinguished Flying Cross (7), Commendation Medal, Presidential Unit Citation, Navy Unit Citation and two foreign decorations. He was badly burned in a landing when he was a test pilot, but made a good recovery. His last command at sea was the carrier USS Ranger. 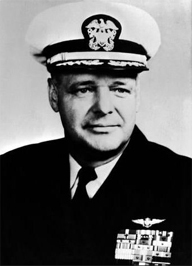 For several years he was president of his Naval Academy Class (1939). He practiced law in Arlington, VA, for several years. Duncan passed away Dec. 15, 1995. Submitted by DeWitt M. Patterson. George Duncan served on the USS West Virginia from June 1939 until August 1941 when he was transferred to NAS Pensacola for flight training. He went on to become an Ace Aviator shooting down 13.5 Japanese aircraft.